Long time no bleep. Sorry, I’ve been very busy, and still no case for my modular (well-meaning inquisitive look in Shawn’s direction), so no posts for you. But I *am* trying to sell my Waldorf RackAttack. It’s a fairly rare hardware implementation of the Attack software synth. You’d be hard-pressed to find a more flexible hardware drum synthesizer. It’s a great little box, but I don’t find myself using it often, so it needs to go to a loving new home. Because of that, I took pictures, which is why I’m posting here. Click the pic below to go to the whole flickr set. If you’re interested in purchasing, contact bdu at fdiskc dot com. 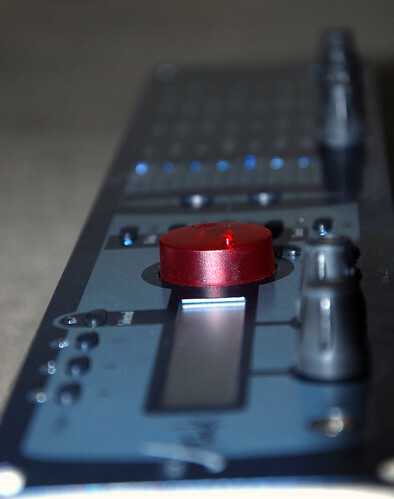 I just got a hot little email in my inbox announcing a special edition Machinedrum UW and Monomachine (in red and blue, respectively) as a celebration of Elektron’s birthday. For now they are available only to those with Elektron “friends” accounts, so if you’ve got one head on over and check it out.